Rock-cut architecture is the practice of creating a structure by carving it out of solid natural rock. There are more than 1,500 rock-cut temples in India, most of which are religious in nature, adorned with decorative paintings and exquisite stone carvings reflecting a very high level of craftsmanship. In India, caves have long been regarded as sacred spaces and were enlarged or entirely man-made for use as temples and monasteries by Buddhist monks and ascetics. Indian rock-cut architecture is more various and found in greater abundance than any other form of rock-cut architecture around the world . The Ajanta caves are a string of 30 caves, which were built in two phases between the 2nd century BC and 6th century AD. The Ajanta Caves were carved out of a solid rock along the Waghora River. They were used by Buddhist monks as prayer halls and monasteries. Declared a World Heritage Site by UNESCO, it is also a protected monument under the Archeological Survey of India. 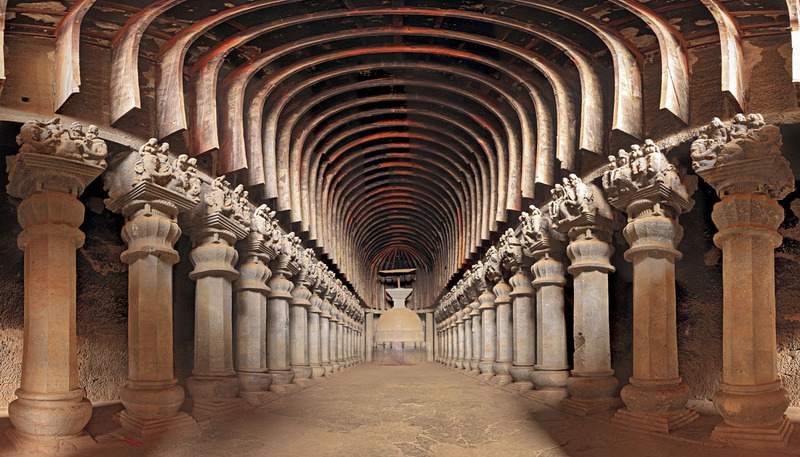 The Ajanta caves preserve some of the best masterpieces of Buddhist art in India. Ajanta Caves were abandoned in AD 650 and were gradually forgotten until their ‘rediscovery’ by a British officer in 1819. The Ellora caves include 34 monasteries and temples located in Aurangabad district of Maharashtra. There are 12 Buddhist caves, 17 Hindu Caves along with 5 caves dedicated to Jaina mendicants. The cave complex extends over 2 kilometers and they were carved out of volcanic basaltic formation. It is a world heritage site and one of most important ancient monuments in India. Similar to the Ajanta caves, the Ellora caves contain many frescoes, reliefs, and shrines, including carvings of Buddha , bodhisattvas, and saints. In many cases the stone is intricately carved to look like wood. Carved out between the 6th and 10th centuries AD, the Ellora caves are one of the largest rock-hewn monastic-temple complexes in the entire world. Ellora is also world famous for the largest single monolithic excavation in the world, the great Kailasa temple. The Elephanta Caves are a complex of ancient cave temples on Elephanta Island, located 10 km away from the Gateway of India at Mumbai. Elephanta Caves consists of two groups of caves; one is the Hindu rock art and the other is the Buddhist rock art. The place is still worshipped by the locals, and is dedicated to Lord Shiva. The origins of the temple caves, thought to date from about the 7th century, are obscure. It is known, however, that the island was originally called Gharapuri – the Portuguese renamed it Elephanta after they found a large stone elephant near their landing place. Bhaja Cave is a group of 22 rock-cut caves dating back to the 2nd century BC located in Pune, near Lonavala, Maharashtra. These caves are cut in steep cliff face 120 m above the surrounding plain, all looking to the west. Kanheri Caves constitute a group 109 of rock-cut monuments located inside the Sanjay Gandhi National Park, north of Mumbai. Built between the 1st century BC and 9th century AD, the Kanheri Caves demonstrate the Buddhist influence on the art and culture of India and offer picnickers a getaway, especially during the rainy season. Majority of the caves are monasteries, intended for living, study and meditation. All of them have elaborately carved sculptures, relief’s and pillars and encompass rock-cut stupas for worship. Karla Caves are one of the ancient caves in Lonavala of Maharashtra that follows the mixed Hindu and Buddhists style of rock-carved caves architecture. The group at Karla consists of 16 rock cut excavations of which cave 8 is the chaityagriha which was carved during Satavahanas dynasty (271 BCE to 30 BCE). These caves are some of the largest rock-cut Buddhist shrines in India. The monasteries at Karla could be datable between circa 60-40 B.C. and 4th century A.D.
Udayagiri and Khandagiri Caves are partly natural and partly artificial caves of archaeological, historical and religious importance near the city of Bhubaneswar in Odisha, India. These two hills represent one of the earliest groups of Jaina rock-cut architecture in eastern India in the field of architecture, art and religion. On the basis of inscriptional evidences, these caves were first excavated by king Kharavela of Chedi dynasty and his successors who were devout Jainas during the first century B.C. The town of Badami in India lies at the mouth of a ravine with rocky hills on either side. Carved out of the soft sandstone of these hill cliffs, the four cave temples of Badami were built by the son of Pulakesi I – Kirthivarman (ruled in 567 – 598 AD) and his brother Mangalesha I (ruled in 598 – 610 AD). Badami Caves represent the secular nature of the rulers then, with tolerance and a religious following that inclines towards Hinduism, Buddhism and Jainism. Cave 1 is dedicated to Shiva, caves 2 and 3 to Vishnu, and cave 4 is a Jain temple. Built in the late 7th century, the Varaha Cave Temple dedicated to Lord Vishnu, is one of the finest examples of Indian rock-cut cave architecture. The Varaha Cave Temple has beautifully moulded lion pillars, while the relief sculptures of Lakshmi, Durga and Varaha, the boar incarnation of Vishnu, are among the masterpieces of Pallava art. The Barabar Caves are the oldest surviving rock-cut caves in India, mostly dating from the Maurya Empire (322–185 BCE), some with Ashokan inscriptions, located at a distance of 20 KM from Gaya in Bihar. Carved out of a huge granite rock, these caves look as if they are cut with a laser. The caves were designed in a way that they look like wood. Though Buddhists themselves, they allowed various Jain sects to flourish under a policy of religious tolerance. These caves have been created in the 1st – 3rd century AD as a Buddhist monastery. Later one of the Buddhist dwellings was turned into a popular shrine of Hindu god Ganesh. Lenyadri caves have preserved traces of ancient cave paintings and inscriptions. The Pandavleni caves are a group of 24 caves which were carved between the 3rd and 2nd Century AD. Although these caves are located near one of the holiest Hindu sites and have a name of Hindu deity, these rock-cut temples initially were started by Jains and later turned into rather significant centre of Buddhism. Located at a distance of around 97km from Dhar Town in Central India (Madhya Pradesh), Bagh Caves are assimilation of around nine rock-cut monuments. The caves were cut into a vertical sandstone rock face by master craftsmen. Meant to be Buddhist monasteries, the caves were made sometime in the 4th or 5th century AD. Though the paintings are disfigured due to age, it is said that the murals expressed lively, beautiful and vivid imagination. The eventual decline of Buddhism in India and its remoteness resulted in Tigers living there, hence the name. Some believe the work was begun by the Buddhist monk Dataka. Dedicated to the Hindu god Shiva, the caves are estimated to be 1,500 years old and are some of the oldest cave temples in Mumbai. They are thought to be the work of Buddhist monks and Hindu priests, and they contain ornate sculptures. The size of the cave complex rivals several UNESCO World Heritage sites nearby, such as the cave temples of Ajanta, Elephanta, and Ellora. These caves belongs to the last stage of the Mahayana Buddhist architecture. The Udayagiri Caves feature some of the oldest Hindu cave temples. They were carved and completed under the patronage of Chandragupta II, Emperor of the Gupta Empire, in the late 4th and 5th century CE. The complex consists of twenty caves, of which one is dedicated to Jainism and all others to Hinduism. One of India’s most important archaeological sites from the Gupta period, it is currently a tourist site under the protection of the Archaeological Survey of India. This rock architecture is just impressive. All I can think about is all that time and dedication by the monks to create beautiful masterpieces that have remained the same centuries later.